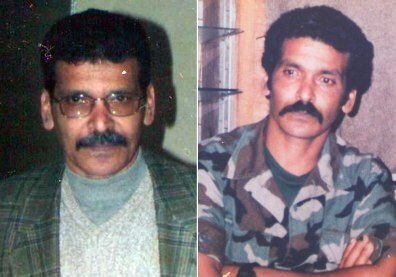 On the right, Ibrahim Elfirjani is seen on the day he left for the U.S. in 1990 after being part of the Libyan opposition army in Chad. On the back of the photo is written in Arabic: “Today, I’m taking off a uniform that is dear to my heart and I’m waiting for the day that I am going to wear it to fight for justice.” On the left is a photo of Ibrahim in Egypt in 2003. He went there to reunite with his wife and two children, who had fled Libya.